Order Of The Eagle Essay for Soror Meral – Zero Equals Two! “Phyllis Seckler (Soror Meral) was an individual of wide-ranging abilities, and amazing tenacity and persistence, all of which she brought to bear to the promulgation of Thelema. She was a mother, an artist and a teacher in many disciplines. She typed many Crowley manuscripts, saving them from potential oblivion. She was a thoughtful and intense student of the occult, a member of both the A∴A∴ and the O.T.O., where she was inducted to the Sovereign Sanctuary of the Gnosis. She was a talented astrologer and had a deep appreciation of tarot. 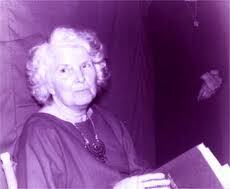 She founded the College of Thelema in order to make basic materials on occultism and Thelema more available. She was the editor of In the Continuum, the College’s journal, for almost 25 years. “As most probably realize, the Law of Thelema was not entirely the result of praeterhuman forces. Crowley, as a scholar and even in his role as Prophet, was strongly influenced by the lives, ideas and works of many men and women who came before him. The road to The Book of the Law was built over many, many years by many, many hands now long stilled. So it is with all the Great Principles of our Order, spiritual, philosophical, and practical. “The roots of our Order extend deeply into history, well before the advent of the New Aeon and the birth of such men as Crowley, Reuss, Kellner, and Doinel. It is these roots which have provided, and continue to provide, food and water to the Scarlet Flower that grows in the enclosed garden of our Order; and we must know and appreciate those roots if we are to truly know and appreciate that Flower.